I had so much fun doing this sweet tabletop, that my mind was already thinking about the next holiday to inspire me. When Saint Patrick’s Day nears it means the first of many outdoor community festivals, the sign that Spring and warm afternoons are near, and for one day we can all have a bit of Irish luck. I was instantly reminded me of the beautiful nature found in Ireland, ethereal deep and loose flowing greens, rich hues like emerald-green, gold and white. The Cream and Irish Clouds shoots, are stunning pieces of inspiration and one of my absolute favorite looks. They create a subdued elegant and simple twist on a Saint Patrick’s day for a whiskey tasting dinner with family and friends alongside with Irish inspired bites and speciality cheeses. Since this year the holiday is on a Monday, it’s a great way to give a nod to the Irish holiday without over doing it. With Saint Patrick’s Day at the cusp of spring, an organic runner of greens, would be a simple and lovely way to bring the first flowering buds onto the table. 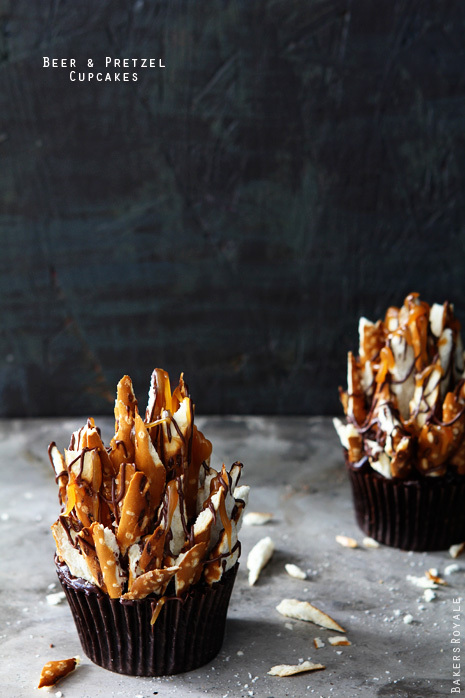 The perfect dessert would be these cupcakes with beer and pretzel topping. Decor should be kept simple and organic, framed gold leaf clovers is simple way to incorporate the holiday while adding a bit of art to your living space too. Have a whiskey tasting setup on a rustic styled bar, with the perfectly picked whiskeys in vintage bottles. Place a personal Irish Soda Bread at each setting on simple yet elegant dinnerware. Have guests sample each, noting taste, color and of course their favorites on cards. Then send each guest home with mini “good luck elixirs” they can fill with their favorite whiskey. Smell: As with all tastings, a sense of smell is important, so you may want to request that your guests skip the perfume. Also, a touch of water in the whiskey helps release the fragrance. Taste: Sip the whiskey, let it roll over your tongue, not swishing it as you would wine, and then note the taste. Typical tastes in whiskey include: peaty, floral, woody, fruity, and smoky. Take it with pickle juice: Yes, it might sound weird, but trust me it’s delicious. It’s rumored to have started with bartenders in New York, and is slowly becoming a favorite new shooter. It’s known as a pickleback shot. A shot of Jameson, is paired with a shot of sour pickle juice. The two shockingly go hand-in-hand, and a pleasing drink for non-whiskey drinkers. Whiskey 101 is a great resource for your next whiskey tasting and learning more about this drink.